Well... "Here we go again... It's the same old song..."
Since the blog's a few weeks behind, let me rewind it, briefly. After the last PICU/TICU hospitalization in mid-January, we were discharged, and home for about 4 days. We then had to bring Evs back in for another ~4 days or so, just as she was starting to work a little hard again at breathing, but it was a relatively uneventful stay on "the floor" (non-ICU). This made for more days of January spent in the hospital than out - but, nonetheless - we got out! Coming out of all that, we ended up with nursing care at home during the week, to help keep up with Evs' daily routine (breathing treatments throughout the day, etc). And from then until now - things were going pretty well! Evs was returning to "herself"; she wasn't needing significant oxygen at night; she was getting back in to therapies - "etc". But, then - we get to "now". Right at a week ago, when the weather was equally nice, we took Evs out for a few hours, and opened the windows in the house, to get the "stale winter air" out, and get some of that fresh spring air in. We don't know yet if that's what did it - maybe triggering some allergies - or if Evs picked up a random virus while out & about, or otherwise - but Monday (29-Mar), she started having problems keeping her oxygen saturation up, and Kim & her nurse took her down to the ER. She seemed to settle out over the day, so she was sent him. Tuesday morning (30-Mar), she had a follow-up appointment with her pulmonologist. She saw the PA, who didn't see anything acute of note, and just had a general follow-up-type-of-visit. By that afternoon, though - testament to how fast these things can move - she had a mild fever a was on 3L of oxygen, and still wasn't quite keeping her saturation up. So, back to the ER she went. After a somewhat-aggravating experience (as Platinum Medallion/Super Elite Frequent Flyers at Scottish Rite, we're not used to having a hard time in getting our way ;-) ...) and a chest X-ray, Evs was admitted, with likely diagnosis of pneumonia. Again. 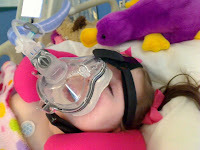 At any rate, over the course of the evening, she really just couldn't keep her oxygen saturation up - the pulmonologist on call for the night, who had thus far been working from home, came in about 2AM to check her out & work his magic in-person, but he finally had her sent upstairs to the PICU. Again. After trying their luck with a high-flow cannula - which was the most support she ever got on her last stay - we still weren't getting good numbers, so they bumped her to a BiPAP (what Evs is so graciously modeling in the picture). In very short, it's a mask that seals around her face, and provides both inhale and exhale pressure, to help give her a little more "oomph" to her breathing. This both helps keep her airway open, and also helps "fill out" her lungs a little more, to help fight or prevent atelectasis (when the alveoli in your lungs - like teeny little balloons that help you breathe - deflate or collapse on themselves). After about a day and a half of that, she really started to show some good progress - they bumped her back down to a high-flow cannula, and she was really holding her own. Also encouragingly, her blood cultures didn't show signs of infection, which likely ruled out a proper pneumonia, and likely just the aforementioned atelectasis. She was clearly starting to feel better, as she was able to use her button to tell us she wanted pigtails, what she wanted to do, etc. And then she had a seizure. Now - Evs has seizures. We don't like it, but that's her baseline; it's part of her life. Honestly, it was probably prima facie evidence to the fact that she was indeed feeling better - "returning to normal" - which for her, includes seizures. However, this one didn't stop (also not uncommon for her seizures when "coming out of a painful episode", such is illness, or cutting teeth, etc) - so they had to administer Ativan. Which still didn't cut it, so they had to go for a little more, and finally some Diastat. Both of which are related sedatives, and make an already-floppy airway more floppy.... and you can probably see where this leads. It could have been an aspiration episode during or after the seizure (of refluxed food, or her own secretions), or it could have just been more obstructed breathing - but ultimately, it led right back to BiPAP. Which is where we are tonight. It's certainly frustrating to take two steps forward... then one back... then at least another half-step back (if not a whole step). On the up-side, Evelyn's body doesn't seem as stressed as before - likely because it's not an infection or "proper" pneumonia - last time, her heart-rate was consistently 160+ BPM, and her respiratory rate was equally-consistently 60+ breaths/minute. Both measures are significantly less this time (though her heart-rate crept up some today...), which is a good thing - she just seems to be having a hard time keeping her oxygen saturation up. On the down-side, it's certainly unpleasant that she's having these issues at all. It's also a little more bothersome that she's spending more time on the BiPAP - which for all the trouble she had on her last stay - she never used. At this point, it's most "watch, wait, and continue respiratory treatments". To try and get more to "root cause", it boils down to two issues (at risk of oversimplifying) - preventing her from catching germs (viral or bacterial), and preventing her from aspirating. The former should be getting easier by the day, as the weather warms up, and there's obvious measures we can take to at least help (keeping her out of crowded areas, etc). The latter is a little more complicated. Outside of gradual speech therapy, there's not tons you can do to quickly & markedly improve swallowing skills such as to prevent aspiration. So you're left with treating the cause of things getting into the airway to be aspirated in the first place. In Evs' situation, those things likely come from 2 places: things she may reflux up, and her own secretions (e.g. saliva), particularly during a seizure. So, we are beginning to talk about a Nissen fundoplication to prevent or rule out any reflux as part-cause of aspiration. We've also been considering a Vagus Nerve Stimulator for a few months, as a next-step in trying to get her seizures under a little more control, and will likely take at least the next steps towards that during this hospital stay (a 48-hour EEG). The timetable on either of those is still a little uncertain - but will likely be in the "near-ish future". Of course - first thing's first - she needs to get to breathing better! So that's where we're at. Not a lot of "great" news, I'm afraid - but, at least as of this writing - she's holding her own, and not in a rapid or marked decline. The more these things happen - and the more "help" she needs - the more it bothers Kim & I, to be sure. But, as usual, Evs is fighting it all with superior grace, style, and just a little bit of 'tude. ;-) So I will sign-off focusing on that, and thank you all again for the thoughts & prayers - and wish a Happy Easter to all! Uncle Frank said he sends his love. We all know you are a fighter (with such grace, of course:-)We love you and will be right there for you! Tell Evelyn to hang in there, and that there's nothing wrong with a little attitude here and there! Keeping everyone in my prayers! We all love you, Evelyn. You have to fight all of them. I'm praying for your health.